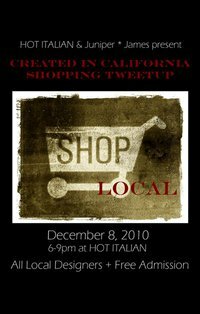 This Wednesday, December 8th from 6:00 - 9:00pm, find yourself at HOT ITALIAN for a special shopping Tweetup. Mix and meet will be a medley of local vendors selling beautiful handmade goods and fashion all made right here in California! Put the fun back in shopping for the holidays and enjoy complimentary pizza as you shop. This is a FREE EVENT and all the money that the vendors make goes right back into their pockets, so you'll feel good about supporting independent designers. 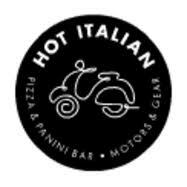 Also, don't forget that HOT ITALIAN also offers lots of great gifts that are made right here in California including their latest collaboration with Rickshaw bags. SHOPPING LOCAL JUST ADDS UP. How I wish I could be there, sounds so FUN!!! i wish i could be there as well!!!! Comtesse: Ireland is MY dreamland! Ah, Sacramento: I miss you! I'll post pictures if I can. Lil Bits and Kari: I'll see you ladies there! And JJ, my dear amiga Jemina, how I wish you could be there too. I think you would LOVE it! You are so very supportive of your fellows! Me too, Reva! I'm really looking forward to this.